DOES, BUCKS, TROUBLE & ALLIE! KIDS ARE AVAILABLE AT EMMANUAL FARM IN CORDOVA, S.C. CALL US FOR INFORMATION. We are sold out . WE ARE A USDA CERTIFIED SCRAPIE FREE FARM. 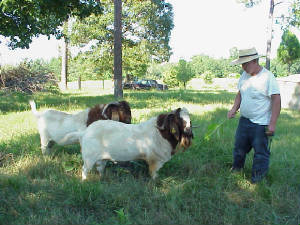 THE FIRST MEAT GOAT FARM SO DESIGNATED IN S.C.
We hope you enjoy scanning our site. We ask you to please sign our guestbook on the Contact page. We also hope that when your're in our area you'll stop and visit. We are easy to find; just a few miles from the Santee State Park and Santee national Golf Course. We are half way between Charleston and Columbia and twenty five miles from Orangeburg. If you have any questions relating to goat care, health, shelter, fencing, etc. feel free to contact us by phone or E-mail. If we don't have an answer we will refer you to someone who does.